Personalized wall plaques make superb gifts for special people in your life that have been recognized in publications. Great news should be met with great gifts! Nothing is worse than having a great article become damaged, faded, or lost. When you take that recognition and have it professionally mounted on a personalized wall plaque, you are ensuring the article lives on. Having the article mounted on a beautiful display plaque reinforces the thrill of seeing the article the first time! Do you have someone in mind for a commemorative plaque? Here’s how to get a free online preview-click here. Adds that special touch. By personalizing a wall plaque, you help the person featured “stand out”. Unique. 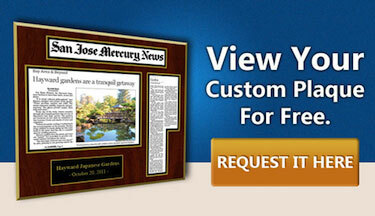 Personalized wall plaques offer a distinctive way to showcase an article or recognition. Suitable for anyone in your life. Personalized wall plaques make fantastic gifts for family members, friends, and co-workers. Long-lasting. The plaques are made using the finest materials and are guaranteed to never yellow or fade. When looking for a unique way to recognize someone in your life, consider a personalized wall plaque to showcase their accomplishments. What are the most popular forms of recognition that you’ve received? Please share your experience, below.